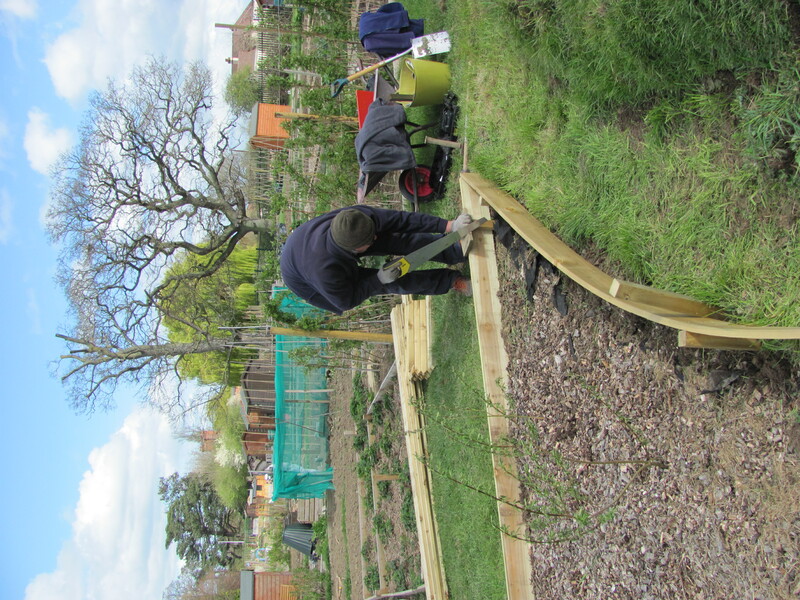 Mid-April saw our second allotment site working party. The weather forecasters warned us of regular showers with some very heavy and accompanied by thunder. They were so wrong! We had a bright warm day when we worked away under a clear blue sky. Plenty of busy helpers turned up and I set them to work. The urgent task was to prepare soil in which to sow a wildflower mixture donated to us by the RHS to celebrate the Queen’s Jubilee. Digging over the patch was hard work as we kept bringing up pieces of old broken bricks. As a nearby plot has yielded a couple of very old clay land drains we came to the conclusion that we were digging up the site of an old stable yard. But soon the area was dug over by Di and Jude, rotovated, and raked to a fine tilth. 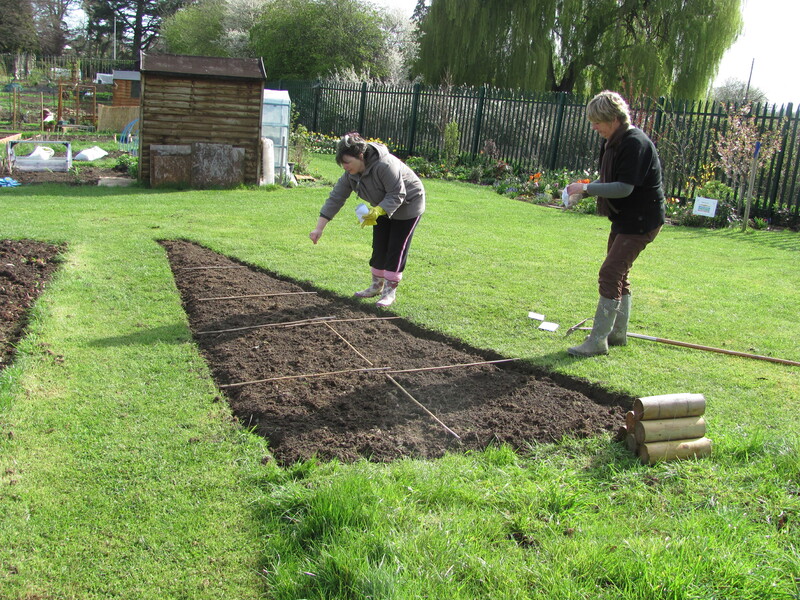 The bed was divided up into square yards to help even seed distribution. Jill and Jude then carefully broadcast the seeds. 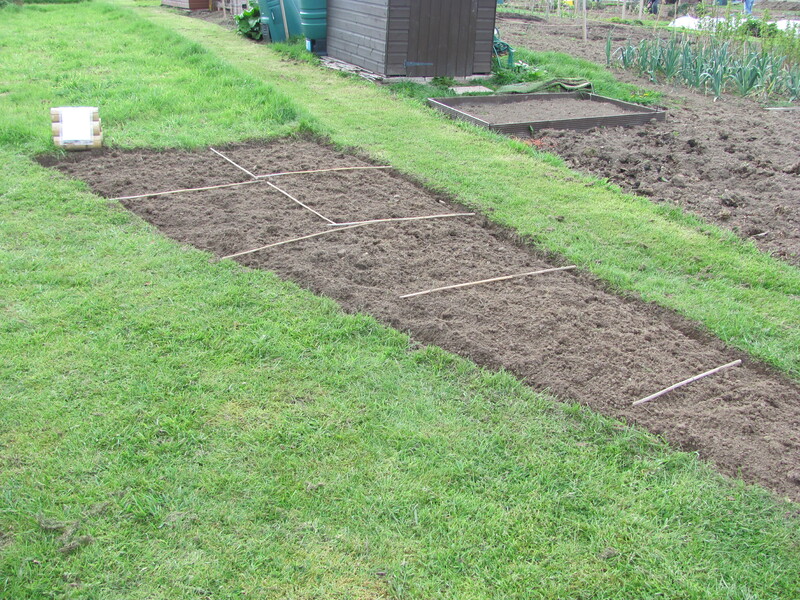 A little firming with the back of a rake after a gentle raking over to ensure the seeds were in good contact with the soil and the job was done. They should germinate quickly as the soil is moist and quite warm. 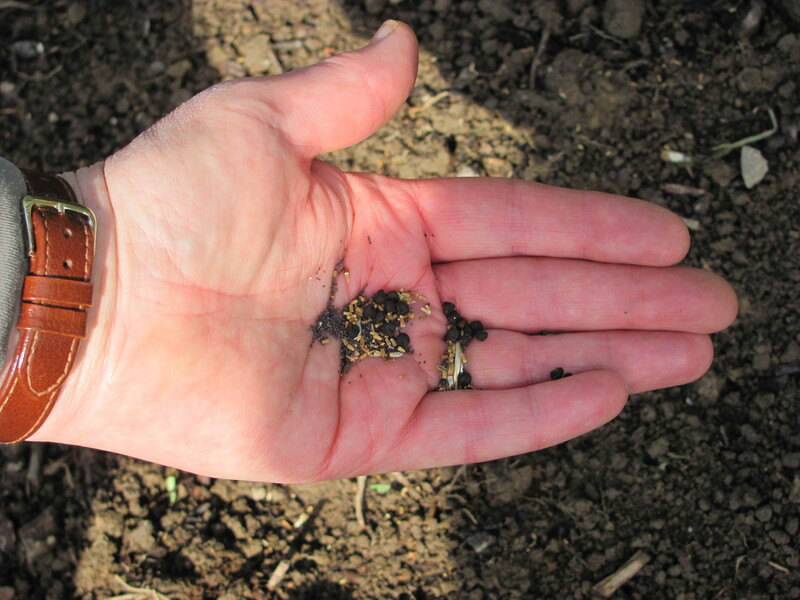 The seed left over was sown in a bed we dug out to extend the Autumn Garden. 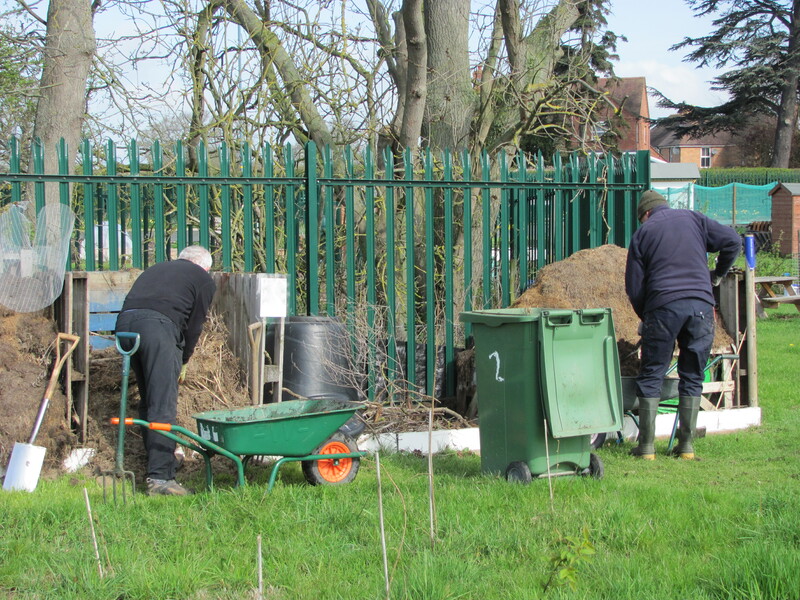 The heaviest task of the day was to begin to sort out the site’s compost area, which has to be moved ready for the development of the new site extension. 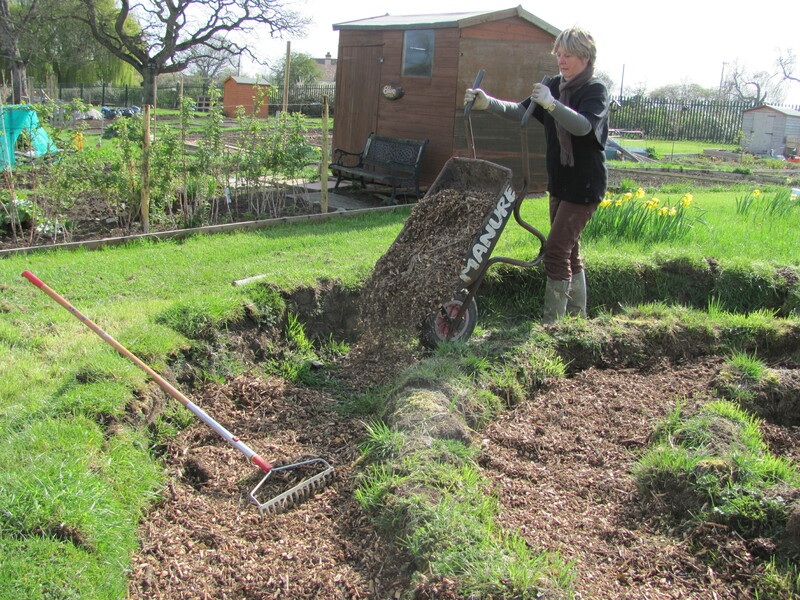 The good compost was utilised in growing areas and the poorer bits used to level a rather bumpy slope which we are slowly planting up with wildlife friendly plants. John, Pete, Gerald and Geoff toiled away at this for several back-breaking hours. By noon we were all ready for a well-earned rest with coffee and nibbles. Some of us eat healthily with our fruit while others enjoy their chocolate biscuits and cake. All good for energy though! And we certainly need plenty of that to tackle jobs for a few more hours into the afternoon. Our existing meadows needed a weed so Julia, Di, Jill and Gill set about weeding out any pernicious weeds. On hands and knees aided by kneelers they cleared the meadows of thistles, dandelions, creeping buttercups and groundsel, the rampant spreaders and prolific seeders. So we sow some native plants and weed others out, but it does make sense, as we do not want these pernicious weeds spreading onto plots. The path in the Turf Spiral needed some more wood chip spread on it to level it off and make it feel softer for the children to walk on. 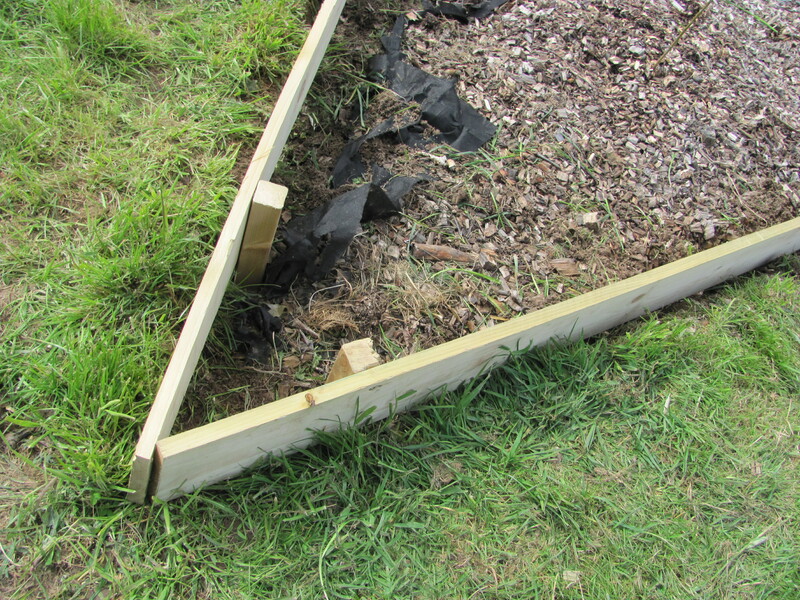 A few days later a few of us returned to complete a job we didn’t have time to do on the Working Party, fixing wooden edging around our Withy Bed. 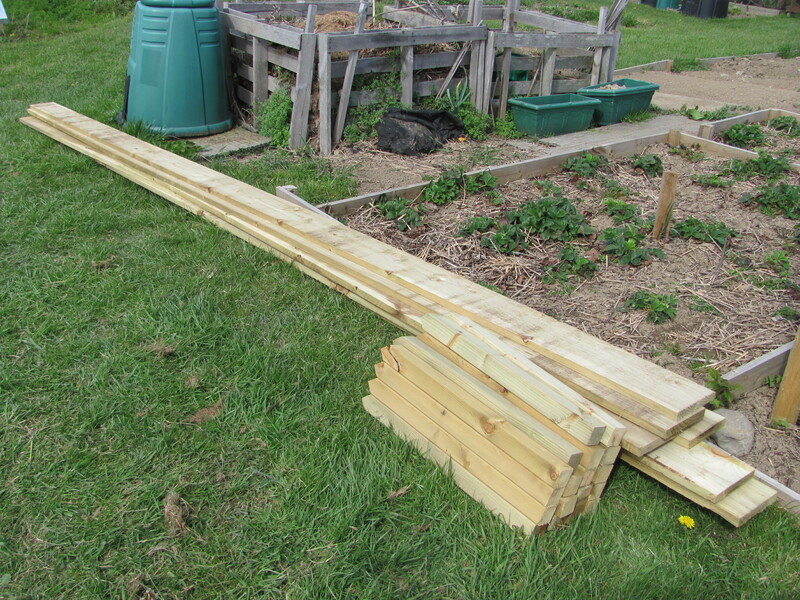 It was hard work bending the planks around the curved edges and then hammering in stakes to hold it in place. Wielding sledge hammers and lump hammers for hours wore us out but we did get a few coffee breaks, forced on us by occasional heavy showers. The day after we all ached in our shoulders and upper arms, but it does look good now it is done and will make keeping the edges tidy as we can trim the grass right up to it. 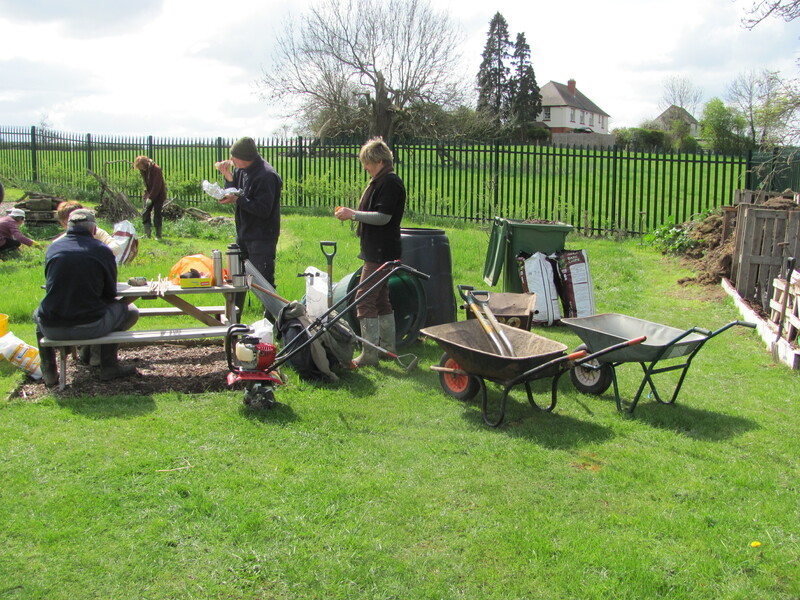 So we succeeded in getting lots done to our communal green spaces in April. All that’s left to do before the end of the month is to prepare the Working Party tasks for May. 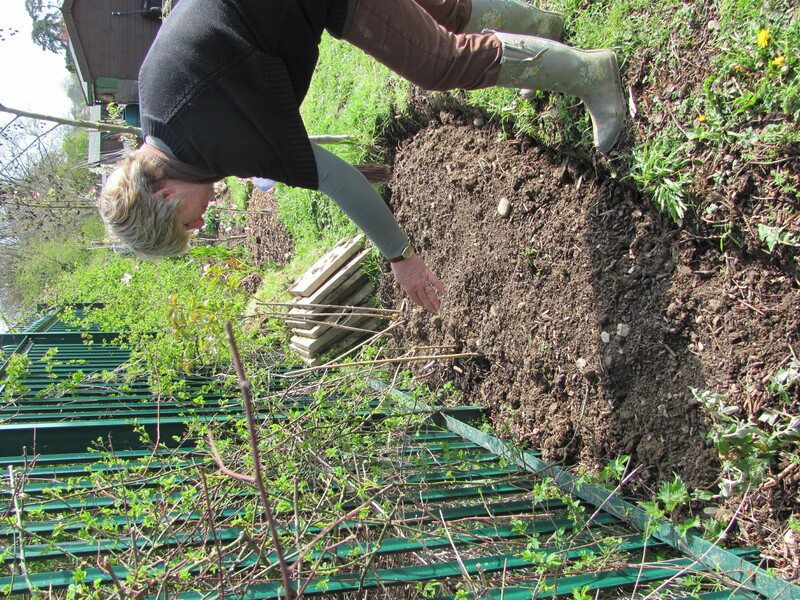 This entry was posted in allotments, community gardening, meadows and tagged allotments, community gardening, garden photography, gardening, grown your own, meadows. Bookmark the permalink. 6 Responses to April Working Parties. My you do work hard – but it is looking good – your weather has been better than ours – I haven’t been able to get on the garden for a couple of weeks. Believe it or not the lottie site is now water logged!! Beautiful – just beautiful. I cannot wait to see the wildflowers as they grow. Thanks. The seeds have already germinated so things are on the move. So lovely to see everyone working together to accomplish a goal. Thanks Margie. It is very rewarding to see all the volunteer work going on here.